Homes for Sale in Bainbridge Island: Find Bainbridge Island community and real estate information. Get details on Bainbridge island homes for sale, neighborhoods, schools, waterfront amenities and more. Find surrounding area community and real estate information, including Queen Anne homes for sale, Mercer Island homes for sale, Bellevue homes for sale and Poulsbo homes for sale, with the unique lifestyle resource and map-based search on www.SoundCounselRealty.com. Contact us for more information. Bainbridge Island, Washington consists of a beautiful community and real estate market on the Puget Sound. West of Seattle, across a strait of the Puget Sound, it possesses many advantages in secluded, northwest countryside living. At the same time, it hosts many self-contained features, conveniences, services, businesses, top-rated schools, and residential communities. When it comes to Bainbridge Island WA real estate, these communities showcase lush, well-planned neighborhoods, surrounded by volumes of natural woodlands and beauty. People choosing from homes for sale on the island gain easy access to all the downtown Seattle attractions, with the Bainbridge Ferry, a 35 minute commute. Engaging features and activities abound on Bainbridge, including outdoor recreational, educational, cultural, business and residential opportunities, with boating and waterfront havens all around. 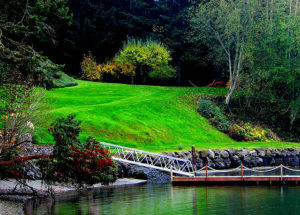 In fact, Bainbridge Island WA real estate hosts a rich assortment of premier waterfront locations and properties. Individual neighborhoods include Fort Madison, Wing Point, Rolling Bay, Hidden Cove, Meadowmeer, South Beach and Manzanita. They include Manitou, Seabold, Winslow, Rockaway, Bill Point, and more all offer distinctive, unique charm and character. Magnificent estate in Port Madison with 217' of low-bank waterfront. The home enjoys one of the longest deep water docks on the island ~ with a boat lift, too! Meander through over an acre of beautiful, mature and professionally landscaped gardens. This incredible home was designed by Roger Katz and built by Fairbank Construction. The property faces west for all day sun. There's a pool, wine cellar, movie theater, and finishing touches that are quite noteworthy. Island living at its finest! Directions: From Hwy 305; east on Day Road; immediate north on Phelps Road; west on Euclid Avenue to address. This beautiful, no-bank waterfront estate is the epitome of island living. The custom built home enjoys sweeping views of the Olympic Mountains and Rich Passage. Impressive and tasteful finishes throughout make this marvelous home a dream; a chef’s kitchen with marble counters, light-filled and open living spaces, and French doors leading to a wraparound deck and grounds. Play tennis, launch a kayak from the boathouse or go paddle boarding—or simply meander the parklike 1.6 acres. Island life! Directions: Miller Rd to West on Tolo Rd, continue across Battle Point Dr to "T", turn R to address on L.
Magnificent Olson Kundig designed international-style home on Bainbridge Island’s Point White Drive. The nearly 5300sqft home is perfectly sited on over an acre with 220’ of no-bank waterfront. Views of Mt Rainer, ferries passing by through Rich Passage, and southern exposure for all day sun! Exquisite finishes throughout with mahogany, cedar, glass, and stone. Truly, a livable masterpiece. This is the first time this home has been on the market. The epitome of Island living... Directions: From Lynwood Center Road; Turn west on Point White Drive to the address. Classic custom home on desirable Port Madison with 83' of low bank waterfront. Enjoy views from nearly every room. Bask in the sunshine while sipping coffee on one of your many balconies. Soak in the luxury of your master bath while looking out at your shared deep water dock and croquet lawn with fabulous landscaping. Entertain in your luxurious chef's kitchen and let visitors enjoy the perfection of their guest accommodations. Island living the way it was meant to be! Sellers are WA RE Brokers. Directions: From Hwy 305 heading North, Right on Day Rd, quick Left on Phelps, Left on Euclid to home on left. Like New, Luxury Waterfront Home with unparalleled views to the Cascades and Olympic Mountains from every room. High-end, spacious kitchen is the centerpiece to the dining, family and sitting rooms. The living room has a spa-deck. Lower level offers a full apartment with office, kitchen and family room. The third floor is entirely devoted to the Grand Master Bedroom with balcony and sitting room. Elevator to all three floors. Kayaking, paddle boarding, crabbing, fishing from your private dock! Directions: Sunrise North to Right on Point Monroe Dr. Address on left. PNW Custom Waterfront gem inspired by Timberline Lodge, set in mature evergreen overlooking Fletcher Bay w/ breathtaking views of the Brothers. Exposed beams, hand-forged iron hardware, 2-story LR fireplace & fir built-ins throughout. Spacious kitchen with top-line appliances, formal dining room with adjoining deck. 4 bedrooms up including master suite with attached 5-pc BA, office, FP & private deck. Huge bonus room. Smallwood-designed shop/studio w/kitchenette, loft and cozy gas fireplace. Directions: High School Rd to Fletcher Bay Rd, at “T” go right; 4 way stop sign at New Brooklyn take Left, go to Springridge take a left go o Hansen Rd take a right follow to address & sign on left, waterfront. Welcome home to one of the Island’s finest waterfront neighborhood enclaves on coveted South Beach Drive! Steps from Fort Ward Park this sublime low bank waterfront retreat features 90' of sandy beachfront and spectacular views of deep blue Puget Sound, passing ferries, and the Olympic Mountains for world class sunsets. The luxurious custom home offers a private main floor master suite, a perfectly positioned gourmet chef's kitchen, and stunning views from most rooms. Very best of island living! Directions: Blakely Avenue to right on Country Club Road to right on Fort Ward Hill Road to right on South Beach Drive to address and sign on left. Quintessential Bainbridge Island! Private 100’ no-bank waterfront on coveted Rockaway beach. Jaw-dropping views of downtown Seattle, Mt. Rainier, the Cascades, and ferry! Gorgeous yard w/mature plantings + a darling path to the beach. Dramatic 2-story entry + Great room, kitchen, family rm, laundry/mud rm +2 BRs + Full BA on the main floor. Ascend to 2nd level sitting rm/office + master suite w/vaulted beam ceiling + french doors to balcony. Kayak or paddle board right off your own beach! Directions: Eagle Harbor Drive to Rockaway Beach, south to address. Gorgeous contemporary home in desirable Wing Point neighborhood has stunning views of downtown Seattle and Mount Rainier. Just minutes to the ferry and downtown Bainbridge for shopping and restaurants. Newly remodeled in 2017 with a chef's kitchen including Wolf, Sub Zero and Miele appliances. Spa like bathrooms include Pratt & Lambert tile. Walls of window open up the view to enjoy. Spacious deck and big yard take in the view as well! Perfect for relaxing and entertaining. Solar system. Directions: From the ferry go east/right on Winslow Way. Left on Ferncliff Ave, right on Wing Point Way all the way to the end and then left on Madrona Drive. 1.5 miles from the ferry. Enjoy sweeping views of downtown Seattle, the Cascades, Mt Baker, & Puget Sound from this elegant Rockaway Beach home. Set on 60' of level, no-bank waterfront w/a fabulous beach & lawn area, this meticulous home is an entertainer's delight. Gracious layout maximizes spectacular views & balances formal/casual living spaces. Luxury abounds in spacious top floor master w/fireplace & panoramic views. Lower level rec/bonus room plus workshop, storage & boat garage. Watch ferries glide by day & night! Directions: W on Winslow Way, R on Madison, L on Wyatt, L on Eagle Harbor Dr which turns into Rockaway Beach Rd. Address on the left. No sign. Eclectic Bainbridge beach house merges w/modern sophistication ~ two tax parcels ~ 1.40 acres ~ echoing beauty of blue waters, Cascade peaks, twinkling city spires ~ prodding imaginations. Sea-paths of marine action ~ virtually steps to 200' of private, sugar sand beach. Charm angled w/imagination ~ Gleaming Cherry wood floors, wood beams & ceilings, cozy fireplaces, skylights, built-in bookshelves & more! All at the end of a quiet, romantic street just minutes to Winslow & the Seattle ferry. Directions: From Hwy 305 go east on High School Rd. to left on Ferncliff to right on Byron to left on Grand Ave. to right on Broomgerrie to address at the end of road.